Let me tell you a story from when I was a young lad. A story that always reminds me of the past, but not because it is of my own past, but because it is a story of another history, one of long ago and far away. I first really and truly watched Star Wars when I was eleven years old. At Christmas time, no less. But I was actually exposed to it in would be one of many common experiences of my childhood. My dad was in the living room on a weekend evening and I strolled in to find him just in the midst of a Star Wars marathon. I sat down and was enthralled immediately. An odd kid looking to escape from the doldrums of youth. I had found one of my many happy places. Then again, as I mentioned, the next Christmas I found a box set of Star Wars under the tree with my name on it. Thus began a lifetime of fandom. Gareth Edwards is a fairly young director. At age 41 he has directed only three major films. The first was Monsters, an independently made science fiction feature, followed up by the 2014 Godzilla remake, and now, the first of the Star Wars anthology films – Rogue One. Rogue One is the original Star Wars fan film. It hits all the major heartstrings, while providing enough visual interest to feel different than the the original trilogy – a future that has already happened. Now, I’m going to do my best not to retell the whole plot of Rogue One, because I think that this story deserves to be seen first rather then read. But I will give you a brief overview out of consideration for what this movie does. Galen Erso (Mads Mikkelson) has hidden his family away from the Empire. One day Director Orson Krennic (Ben Mendelsohn) arrives to get assistance in completing the Death Star. In the process Galen’s wife Lyra is killed, Galen is captured, while daughter Jyn escapes and is taken to safety by Rebel extremist Saw Gerrera (Forest Whitaker). Jump forward fifteen years, and Empire cargo pilot Bodhi (Riz Ahmed) has defected, and smuggled a message from Galen to Saw… One that will set forward the next three films in the main Star Wars story. During this story we see adult Jyn (Felicity Jones) meet fellow rebels Cassian Andor (Diego Luna), reprogrammed Imperial droid K-2SO (Alan Tudyk), and Jedha temple monks Chirrut Imwe () and Baze Malbus (). Cassian is on a mission to kill Galen, and prevent the Death Star from being completed, while Jyn wants to get Bodhi to the Alliance to prove her fathers worth. Because of this conflict Krennic does everything he can to tie up loose ends, destroying cities, killing members of the Empire and Rebel Alliance alike, even gaining the attention of Lord Vader. 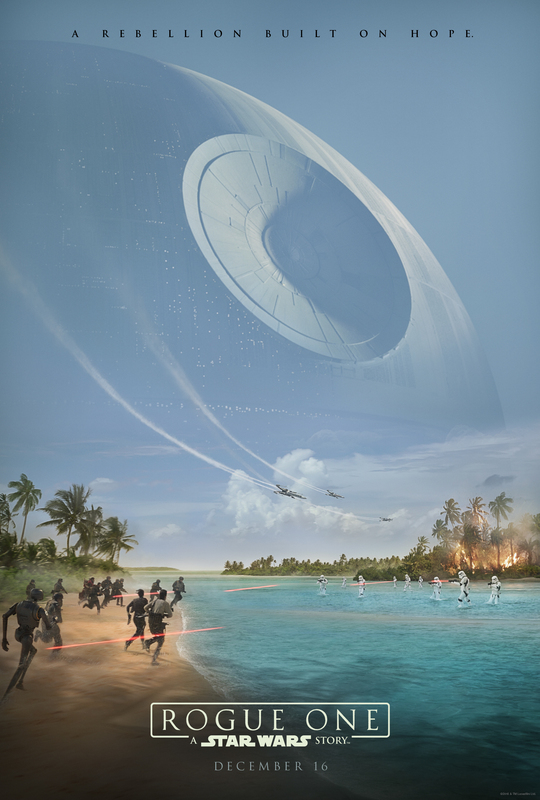 In one of the most epic wartime sequences ever, we witness The Battle of Scarif, where the Alliance fights to gain essential intel on the Death Star. There are heavy losses on both sides, but in the end the Rebels gain a victory and set up the beginning of A New Hope – mere moments later. This is a movie for the fans, made by someone who is a fan of the Star Wars mythology. With direct tie-ins to Episodes I, II, II, IV, and the animated series Rebels, Rogue One is Star Wars. Which probably seems vague, but what I mean is that it is so clearly miming the 1977 Star Wars film, before it became Episode IV, that it can’t help but make us happy. Because it looks new but retains that retro future aesthetic we’ve come to love. Pros: The fast pacing and limited interactions we get with each character only further demonstrate the impact of war on life, appearing at once fully, and then suddenly gone. It expands upon the universe in a very satisfactory way. Cons: After the bleakness and the hard won battle are over, you have to wonder if you really experienced anything new at all. Plus where is the charm? Also, I didn’t like Vaders red eyes, like at all. Points of Interest: The Rebel base at Yavin IV features the same kinds of cardboard cutout ships that the original movie did back in 1977. The is the first Star Wars movie to not mention the name of Skywalker in it. Rogue One is a mad dash to the finish action-adventure film, and one where we know how it all ends. But it’s in the journey that we get to enjoy new characters like Chirrut and Baze, and witness Saw Gerrara as he fits into the mix, as a sort of de-powered Darth Vader. In light of my recent Cross Talk episode wherein we discussed movie Easter eggs, I would like to point out that this film is absolutely riddled with them – and some cameos too! Now to be clear, that doesn’t mean that I want to spoil the rest of my review by pointing them all out, but yes, R2-D2 and C-3PO do make a very brief appearance. Is Rogue One perfect? No, but I can gladly admit that it holds true to canon, is entertaining, and if you are a fan, like the vast majority of the world is at this point, you’ll enjoy it too.